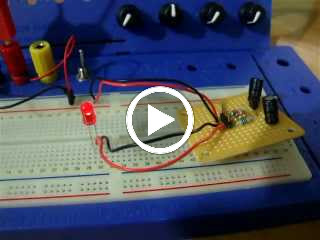 This project takes your new found knowledge of soldering, breadboarding and PUTs to make a pulsing LED mounted on stripboard. I found this fairly easy, but it was a good practice of translating schematic to stripboard, the book does have a diagram of how the components should be arranged; but you can try and convert it yourself first before doing this - it is good practice! The way the circuit works is that the capacitor connected to the anode charges, when it reaches a voltage high enough to pass through the gate the capacitor discharges passing current to the LED, the capacitor discharges resulting in the LED fading from bright to dim. However unlike the last LED oscillating circuit in the book there is a capacitor attached to the LED provide it with current, so it doesn't flash on and off, as instead of turning off the LED is provided with enough current to be lit dimly this creates a 'pulsing glow' as Platt puts it.